But it can beat any. Zorro is the first development suite for financial research and algorithmic trading systems - serious systems that really work. For this, advanced statistics and machine learning functions are available to analyze the markets and determine when to buy or sell. Zorro allows to realize any imaginable analysis tool or trading system with a relatively simple script. It offers extreme flexibility and features otherwise not found in consumer trading software. Easy or full-scale - your choice. Start with the step-by-step programming tutorial. Zorro's C-based script offers a quick and elegant approach to strategy coding. It allows easy handling of time series, datasets, vectors, or matrix operations. Write, test, and deploy simple strategies in a few minutes with a minimum of code. Use the included script editor and on-the-fly compiler for quick tasks. 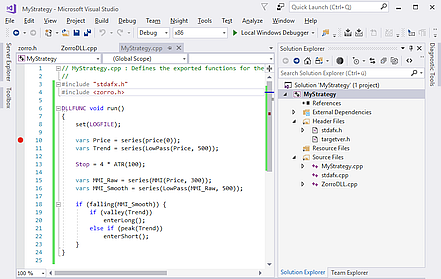 Or create your systems and tools with full-scale development platforms such as Microsoft Visual Studio™ with their advanced debugging and profiling features. It's your choice. Zorro accepts projects as scripts in C, or as compiled C++ DLLs. If Zorro's minimalistic user interface won't do for your strategy, design your own. Define buttons, lists, displays, sliders, entry fields, charts, and reports by script or with an Excel™ spreadsheet. Automate Zorro jobs with batch processes. Control web platforms by sending key strokes and mouse clicks. Implement broker or feed connections with a simple DLL interface. Set up account and asset lists. Define special bars - Renko, Range, Point-and-Figure, whatever - with a simple formula. Check live trading with individual online report pages. Import or export data in binary, CSV, or JSON formats for easy integration in other software packages. Trade options, futures, stocks, bonds, ETFs, CFDs, Forex, and cryptocurrencies. Retrieve live and historical data from online sources, feeds, brokers, or exchanges. Use 1-second bars for high-speed scalping systems. 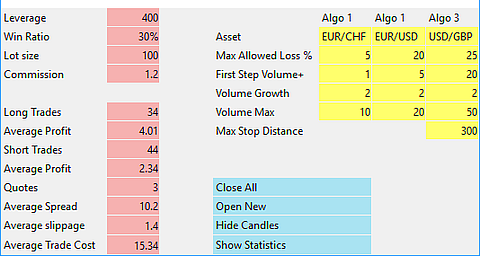 Create arbitrage strategies that exploit price differences between brokers or asset classes. Test HFT systems in 1-millisecond resolution. Rotate stock portfolios with Markowitz- or momentum-algorithms. 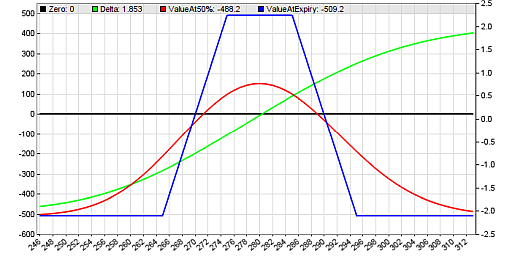 Analyze and trade option combos based on Black-Scholes values, implied volatilities, or greeks. Evaluate the markets with top-end neural network libraries such as Keras/Tensorflow™. Network architectures can be defined with a short R script and integrated in the strategy as a simple indicator that can be trained, validated, backtested, and live traded. Zorro can execute R and Python code and use external machine learning or data analysis packages in this way. Add human intelligence. Feed Zorro with market sentiment data from a multitude of sources. Process option chains for detecting the market's opinion about the future price trend. Analyze candle patterns, market depth, and order flow. Check and optimize strategy performance with the world's fastest tick-level backtester (4 seconds for 10 years). Verify historical returns in high accuracy including commissions, swaps, spreads, margins, and slippage. Step into details with the high resolution visual debugger. Validate results with walk forward analysis, Montecarlo analysis, and various reality check methods. 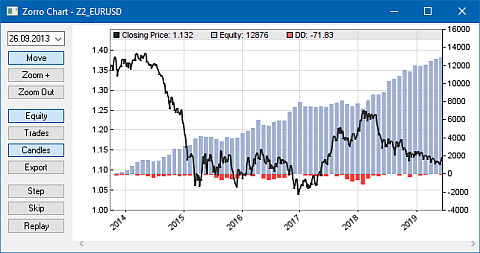 Zorro comes not only with tons of scripts for all possible research and analysis tasks, but also with ready-to-run strategies for Forex pairs, CFDs, stocks, ETFs, options, and cryptocurrencies. The Z strategies cover many markets, risk ranges, win rates, and trading methods. They allow you to already experience a live trading system before developing your own strategies. Still, be aware that all trading strategies are risky, all backtest results are hypothetical, and never risk money you can't afford to lose! Zorro is available in a free version for private traders since its development was paid for. Our sponsor believed that all people, especially in developing countries, should understand the financial markets and participate in their profits. Small, but regular trading incomes for anyone can take liquidity out of the financial system and inject it back into the production cycle. This can boost demand worldwide, reduce the divide between rich and poor, and soften the world's economical and social problems. In this way, Zorro is meant as an incentive to understand, analyze, experiment with, and exploit the financial markets with many different ideas and methods. Zorro's development is ongoing, meanwhile funded by the user community through sponsor licenses, development contracts, and trading returns. New Zorro versions with new features come out every 3-4 months. Software is better when it's free. Try it! Copyright ©2019 by oP group Germany GmbH. All rights reserved. By browsing this website you agree to our data protection policy.